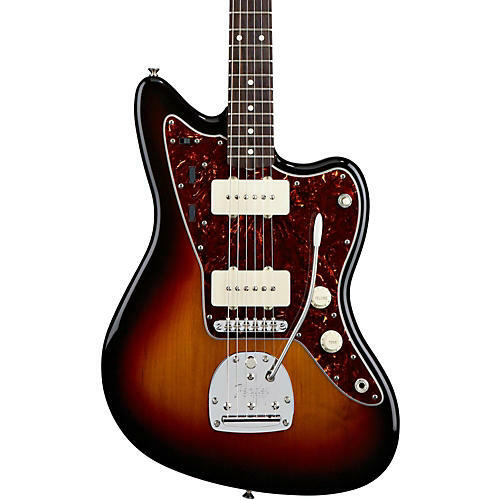 The Fender Classic Player Jazzmaster Special is an electric guitar that updates Fender's iconic Jazzmaster model with some thoroughly modern improvements: Hotter pickups, a redesigned Adjusto-Matic bridge with floating tremolo tailpiece, a 9.5" fingerboard radius and an improved neck pocket with increased back-angle for improved stability and sustain. The Classic Player Jazzmaster guitar's tremolo plate has been moved closer to the bridge to increase break angle and sustain. A screw-in tremolo arm increases stability and control when "twang-dipping".